All interpretations of the theme, applications and techniques are allowed provided that the format constraints are respected. A jury will determine in January the first prize and possible second and third prize. 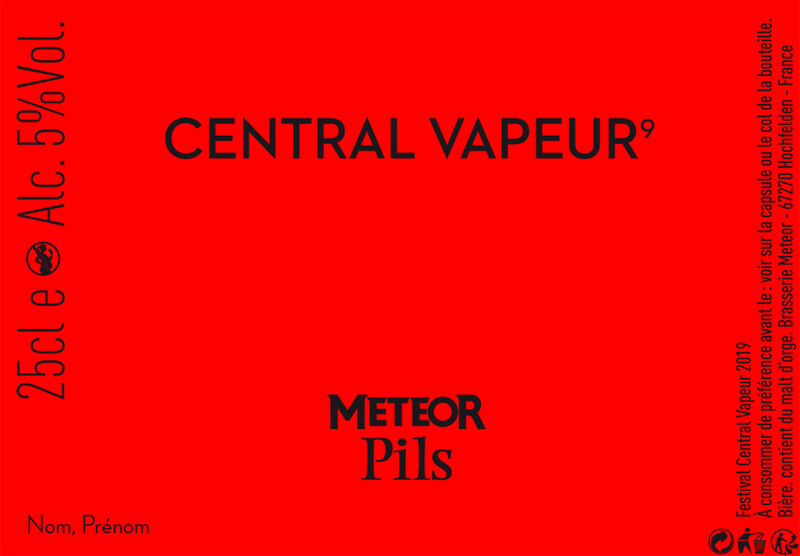 The winning label will be printed and stuck on the 25 cl bottles from the cuvée Central Vapeur 2019, Meteor Pils. Theme: no imposed theme, the beer will be called Central Vapeur 9, Meteor Pils, the label will also include the legal, technical, the name of the illustrator and the website of the association Central Vapeur (see template download). Technique: all techniques authorized but final result provided in TIFF, EPS, AI, PSD, file, 450dpi according to the template to be downloaded lower. Typography and scale: apart from the mandatory and irremovable mentions, it will be possible to change the typos of the words “Central Steam 9” and “Meteor Pils” and to position them differently. However, it will be necessary to preserve the minimum size, the proportions and the legibility of the mentions. Simulation: you can simulate the installation of your illustration on the 25 cl bottle by downloading the mockup proposed below. Deadline for delivery: 14 January 2019 at midnight. Can participate: all adults who wish. Strictly forbidden to minors. Contest registration: thank you fill out the form to fill below to send in the same mail as the illustration. One label per illustrator. Prize: the prize will be awarded during the Central Vapeur Festival, at the latest on the evening of the closing of the Salon des Indépendants Salle de la Bourse on March 31st. Beer diffusion: on the festival and Central Vapeur events in 2019 and in the Meteor shop. The association buys part of the brewery from the Meteor Brewery and sells part of it to finance the competition.